Feedback is one of the best option you have for improving the quality of your site or product. It's a great way to find out about your customers needs and drawbacks of your software. Customer feedback allows you to measure the effectiveness of each customer touch point. The methods you choose to get customers feedback and how you use them depend on your particular needs and what kind of information you want to get from your customers. For example, to find out their real expectations from your products or services, etc. Surveys by E-mail. Survey your customers regularly. Prepare a customer (or guest) questionnaire form. Make sure it is clearly displayed, and thank the customer for taking the time to fill it out. Plenty of people will fill out surveys especially if they get something in return. Promise them a discount or some other reward if they return the completed survey. You must always improve and enhance your product. Customer feedback can greatly help you with it. A new online service introduced by MagneticOne, BetaEasy, is a new customer feedback service to help you improve the performance of your product/application/website. 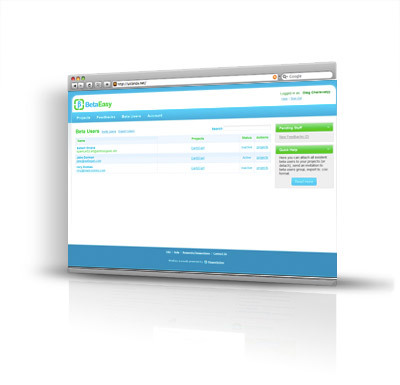 You can use BetaEasy for fast and easy software testing. BetaEasy allows you to collect customer feedback on all stages of your software/website product life cycle, starting with early private beta stages, until final release and during all the time of product functioning. With BetaEasy you will have all customer feedback conveniently located in one place. It gives you the possibility to analyse and manage it quickly and more efficiently. New features are being added all the time and we would appreciate your customer feedback. BetaEasy — it's a good way to improve your software/website and to see what has to be done first.